The Hallis Hudson Origins range of curtain poles combines simple elements of nature with inspiration from the smooth and clean lines of Zen gardens. The collection encompasses six finials which breathe calm and tranquillity into any room. It taps into the ‘Back to Nature’ trend beautifully. Conjure up thoughts of organic ceramics, jute rugs, woven lampshades and linen tablecloths and you’ll be spot on with this trend! A corded wooden pole brings the beauty of a wood pole with the functionality of a track. The track insert can be supplied with a cord for opening and closing your curtains, or without the cording if you prefer to draw your curtains by hand or with a draw rod. These poles are available in a 45mm diameter with all of the Origins finial designs and come with clasp style wooden brackets (colour matched to the pole) as standard. These brackets hold the curtain pole from the top so they don’t interfere with the track profile. Metal brackets are also available if you prefer these. Poles over 240cm are supplied in 2 pieces so are corded both sides. You can specify cording both sides on poles shorter than 240cm. We can make these poles to your exact length. Please note as standard the length excludes the finials. There is a choice of finish for the track inserts. You can choose between antique brass, polished brass, polished chrome or black. There is also a choice of gold or silver cords. The leadtime for these poles is 3-4 weeks. We will notify you via email once your order is on the system and we have a confirmed delivery date for you. Please call us on 01590 615775 if you have any questions or need any advice. 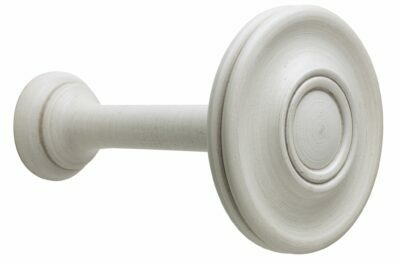 Bracket Text: Metal brackets are supplied with this corded pole set. Bracket fixing type: Wall fix.